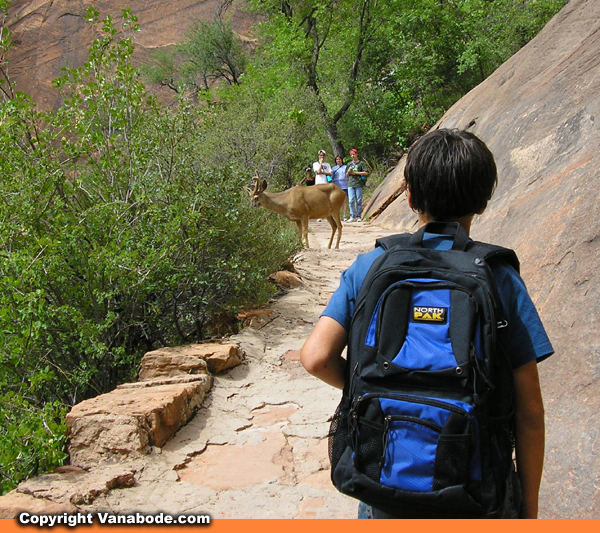 Zion National Park camping, canyon fun, trail reviews, terrain and wildlife overview. This strenuous hike begins at the same trailhead as Weeping Rock and Observation Point. The first mile is all steep switchbacks. After the swtichbacks the trail becomes a narrow cliff-side trail with chains, similar to Angel's Landing. The trail is also called "the great white crack" as it is a side ravine between Cable Mountain and the north wall of the Great White Throne. Be prepared for a steep uphill climb and a steep downhill return. 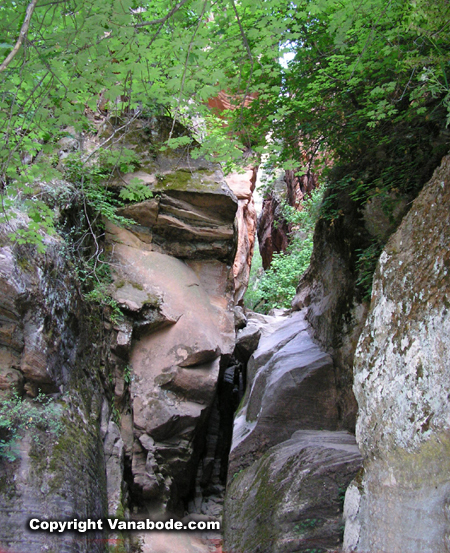 From the mouth of Hidden Canyon you can continue but some bouldering is required over and over again the further you go. A free standing arch is past the official trailend. 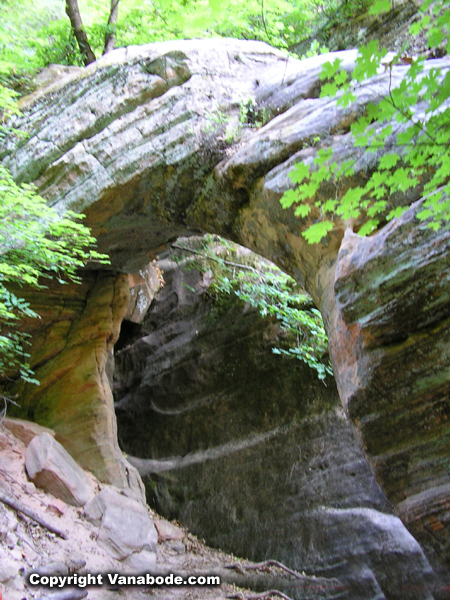 It is easily overlooked, and we did not see this arch until we were heading back. Depending on how far into the canyon you go there are progressively difficult obstacles. The climb will lead out of the canyon to the upper east plateau. 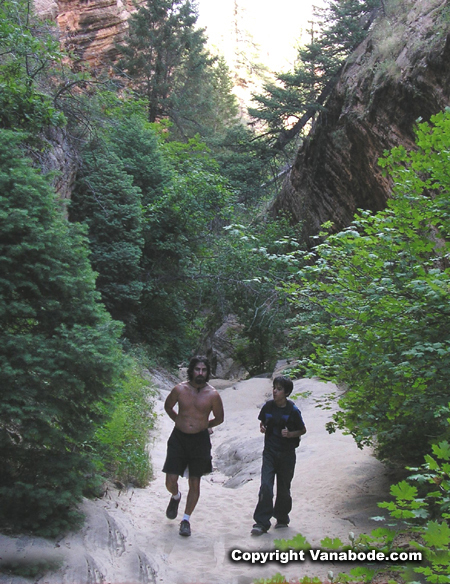 The second freestanding arch in Hidden Canyon is near the top where only a few canyoneers have tread. 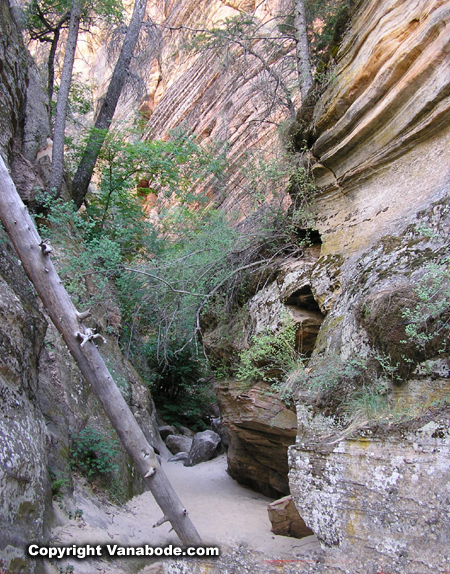 To the mouth of Hidden Canyon is a round-trip of 2 miles and takes about 3 hours with an elevation gain of 850 feet. It is another 1/2 mile past the trailend to the natural arch which is on the right. Once you get into the ravine it is shady and beautiful, but it is those darned switchbacks that will make you want to give up. Jason's thoughts - My second favorite hike. Super easy to get to for the amount of views you get. Less than 10% of the traffic as on the other trails. Some scrambling and a few 15 foot climbs. Shady, quiet, nice. Kelly's thoughts - Beautiful once you get past the switchbacks. I just wanted to go further and further, I didn't care how many rocks and boulders I had to go over. Every time I got over the rocks I felt like what Anna Scott looked like in Notting Hill when her and William Thacker jumped over the fence to see the mysterious communal gardens between the homes. Ben's thoughts - Boring at first but when we got inside the canyon it was nice and shady. We had to climb on lots of rocks. Map location of Zion National Park. 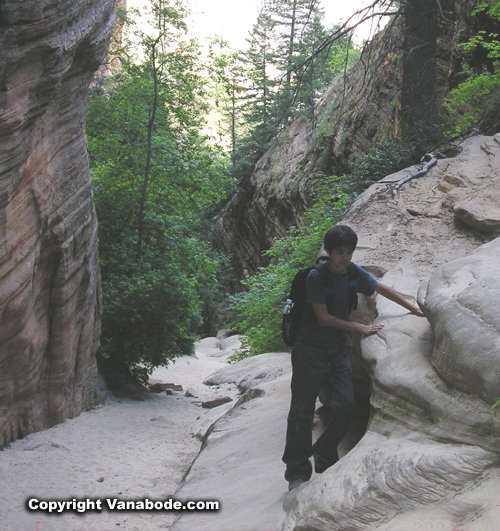 Click for main Zion National Park or full-time rv diary.